Whatever your Valentine loves, Tootsie has their taste buds covered with sweets for your sweet. Is it the chocolate goodness of Tootsie Roll or Tootsie Pops? Perhaps the twin minty tastiness of Andes Creme de Menthe or Junior Mints. Maybe the fruit splashed Raspberry Cremes or Cella's chocolate-covered cherries, or the magnificence of the milk caramel Sugar Daddies and Sugar Babies... Whatever you choose, you are bound to make the sweet tooth of your Valentine fall in Love. Easter baskets need some candy-shaped Love? 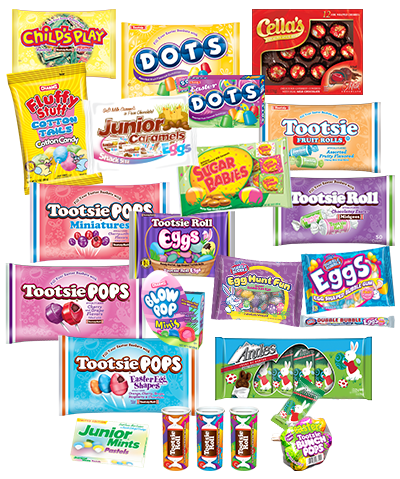 Whether it is for your kids or those who are a kid at heart...Tootsie has some eggselent selections from which to choose. Blow Pops and Blow Pop Minis are a flavorful treat that will add color to any basket; try the Blow Pop Crack-Ups as a special gift. Speaking of colors, Junior Mints Pastels are a fun twist on a perennial favorite, as are Junior Mints. Andes has a variety of chocolate loving options...try the Andes Bunnies, Easter Shapes, Gift Box or let Andes make it easy with their Andes Easter Basket. Another colorful choice to really make your basket pop with fun is Dubble Bubble. Take your pick from the Easter Egg Hunt Fun bag, smaller Dubble Bubble 9-ball packages, or boxes of Dubble Bubble Easter Eggs. Can't decide? 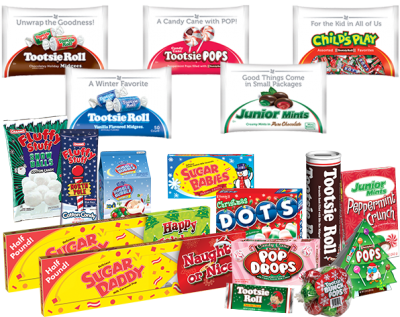 Try a bag of Child's Play, a generous assortment of Tootsie Rolls, Tootsie Pops, Dots, Tootsie Fruit Rolls, and Tootsie Snack Bars, the ultimate, value-packed candy assortment for Easter. Top it off with a bag of Fluffy Stuff Cotton Tails cotton candy. 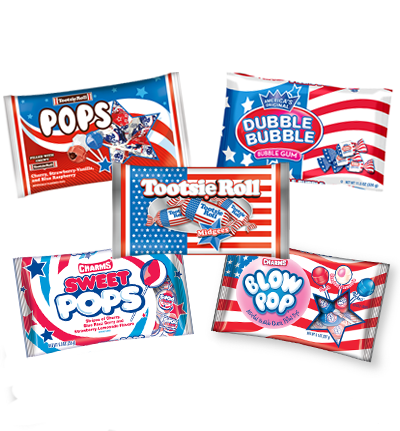 Tootsie is a truly all-American candy so to help you celebrate we have a patriotic selection of candy to make your holiday event one to remember. Choose from Flag Blow Pops, Flag Blow Pops Minis, Flag Charms Sweet Pops, Flag Dubble Bubble, Flag Tootsie Pops, or Flag Tootsie Roll Midgees...or pick them all! They are all wrapped in a flag wrapper, so they are perfect for a parade give-away, family picnic, or your guests at your next backyard cook-out. Halloween is to candy like Christmas is to toys...neither is complete if you can't give the ones you Love to the ones you Love. Having a party? Need something to hand out for those little (and BIG) monsters at your door? The Tootsie Roll family has all the options you need... Charms Pumpkin Pops, Blow Pops Creepy Treats, or Candy Corn Pops are all fun for any Halloween happening. Kids of all ages love watching a scary movie...when they are doing it from home, give them a Movie Time Mini Box, with an assortment of mini Junior Mints, Junior Caramels, Charleston Chews, or Dots. Need more assortment? 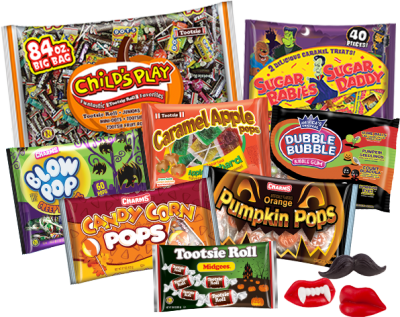 Try giving out Child's Play, a generous assortment of Tootsie Rolls, Tootsie Pops, Dots, Tootsie Fruit Rolls, and Tootsie Snack Bars; it's the ultimate, value-packed candy assortment for Halloween (plus, it’s Peanut Free). Make sure you never run out with a bag or two of 300ct. Tootsie Rolls, and throw in some Spider Web Fluffy Stuff and Wack-o-Wax, great for the treat bags at the door or at your party! Holidays bring visitors and fancy meals and SNACKS! When that snack is a sweet tooth calling Tootsie has the reply. Few candies sing out 'Christmas time' like peppermint...so sing along and indulge that candy-flavored urge with Andes Peppermint Bark, Peppermint Crunch as well as the always mint-tastic Junior Mints Peppermint Crunch and the easy-serving Junior Mints Candy Dish. Add some tasty color to any festive setting with Christmas Dots, Blow Pop Minis, Candy Cane Tootsie Pops and Candy Cane Pop Drops. Didn't get a tree this year? Don't worry....the Tootsie Pop Christmas Tree comes filled with your favorite candy, Tootsie Pops!